Honolulu Police Department officer Wade Tamarra, right, was named the True Blue Hero for August by the American Red Cross and Central Pacific Bank. He was congratulated yesterday by Central Pacific Bank Executive Vice President Denis Isono at the Hawaii Yacht Club. 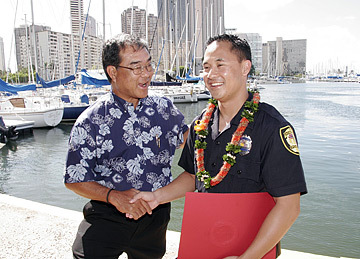 Tamarra was recognized for his heroism when responding to a motor vehicle accident at the Ala Wai Boat Harbor. The driver of the car fled on foot into a boat and struck several other boats in an attempt to get away. Tamarra scaled a fence, ran down the dock and jumped onto the moving boat to apprehend the suspect. The box jellyfish did not show up as expected yesterday, but city officials say the influx is likely to peak today on some southern shores. Box jellyfish routinely show up on southern shores about 10 days after a full moon. Officials warn people who are allergic to the stings to stay out of the water today. Waikiki Beach, Hanauma Bay, Pokai Bay, Makaha Beach and Waimea Bay have been affected by past influxes, a city news release said. A Kalihi tax preparer has been ordered to pay $70,000 in criminal fines and perform 120 hours of community service for preparing false and fraudulent tax returns resulting in hundreds of thousands of dollars erroneously refunded to Hawaii taxpayers. Petala Lakatani, 64, was also placed on five years' probation and is prohibited from preparing tax returns or offering advice regarding taxes. In an plea agreement with the state, Lakatani pleaded guilty to 24 counts of preparing false tax returns, and the state dropped 20 counts of second-degree theft on which he had been indicted. Both charges are Class C felonies. The state said Lakatani claimed excessive itemized deductions on the returns he prepared for his clients. The state Department of Taxation believes Lakatani prepared taxes for more than 600 people over a span of three to five years. More than 300 of those clients have since been audited and ordered to pay unpaid taxes, penalties and interest. An Oahu woman will have to spend more than 15 years in federal prison for selling four ounces of crystal methamphetamine, or "ice," to the FBI during an undercover investigation in June 2005. U.S. District Judge Susan Mollway sentenced Dory Kim Frantz, 41, to 15 years and eight months in prison for conspiring to distribute and distributing ice. A federal jury found Frantz guilty of the crimes in April. Greg Frantz, 40, and Joey Nicolai, 36, were arrested at the time of the purchase. They pleaded guilty to possession with intent to distribute ice. Frantz was sentenced in April to 10 years and one month in prison. Nicolai was sentenced in May to four years and nine months in prison. The operation was a joint investigation by the FBI and the Honolulu Police Department. HILO » A Big Island man died early yesterday after the miniature motorcycle he was driving was hit by a multipurpose vehicle. Police identified the victim as Joseph K. Ferreira, 25, of Hawaiian Beaches near Pahoa. Police said the 63-year-old driver of the multipurpose vehicle failed to yield the right of way while making a left turn off Kahakai Boulevard in Hawaiian Beaches about 9:40 p.m. Wednesday. Ferreira was pronounced dead at Hilo Medical Center. Police said speed might have been a factor in the crash. The death brings the Big Island traffic toll to 23 for the year compared with 21 at the same time last year. Big Island police charged a 16-year-old Kapaau boy with eight counts of criminal property damage and five counts of burglary in connection with a rash of break-ins and graffiti incidents over the past four months. Police said businesses in the remote North Kohala towns of Kapaau and Hawi were targeted between April 24 and Monday. After being charged, the boy was released into the custody of his parents and the case referred to family court, police said. Police are looking for two women in their 20s who allegedly stole a dozen dresses from a clothing shop in Ala Moana Center in June. The dresses were recovered a month later by a store employee who found them at the Kam Super Swap Meet. Police said two women entered Cinnamon Girl at 8:30 a.m. June 23 and allegedly removed 12 dresses and put them in a shopping bag. A store clerk found what happened moments later but could not find the women, police said. Anyone with information is asked to call CrimeStoppers at 955-8300 or *CRIME on a cell phone. Police arrested a 23-year-old Mililani man who allegedly sexually assaulted a 13-year-old girl earlier this month. Police said the man befriended the girl and then at about 9:30 p.m. Aug. 5 escorted her to a secluded area and raped her. The girl identified her alleged attacker in a photographic lineup, police said. Officers arrested the man Wednesday for investigation of first- and third-degree sexual assault. Police arrested a 22-year-old man who allegedly fired a shot at another man on the North Shore on Wednesday. Police said the suspect pointed a gun at a 24-year-old man at about 4:30 p.m. at a Sunset Beach home and fired one round. The older man was not hurt and fled. Police later arrested the younger man for investigation of second-degree attempted murder. Police were looking for a man who robbed a Kailua bank Wednesday. Police said the man walked into the First Hawaiian Bank at 705 Kailua Road at about 1:20 p.m. and demanded money. The man fled on foot with cash, police said. The man was described as in his 40s, 5 feet 5 to 5 feet 8 inches tall, 150 pounds, with a brown complexion, medium build, black hair and dark mustache. He was wearing a blue pullover shirt, blue jeans and a black belt. Anyone with information is asked to call CrimeStoppers at 955-8300. Police arrested a 36-year-old man who allegedly tried to deposit three forged U.S. Postal Service money orders. Police said the man tried to make the deposit at a Kailua bank at about 9:30 a.m. yesterday. Police said bank officials checked the money orders and learned that the serial numbers were fraudulent. The man was arrested for investigation of first-degree forgery and later released pending investigation.